Tell us a little bit about what you make? I make modern style jewelry. 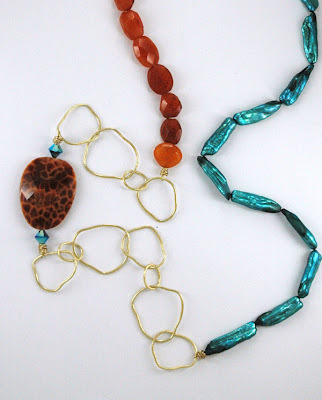 I love to use semi-precious gems with beautiful facet cuts and then sometimes mix them with things from nature, like wood, raw stones, shells, etc. The balance to create something wearable and appealing can be tricky, but it's my signature for design, from the day I started creating things as a hobby, which quickly became a business after I met a sales rep that helped launch my jewelry into the American Specialty Market. To generate a following for my work and of course, to sell as much as I can. I also like being part of the European Teams on Etsy, which creates supportive friendships and provides knowledge you can't get anywhere else. 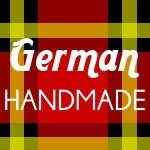 I've made some nice friends from all over the world, being a part of Etsy. Well, I have a couple. One is a ring that I've sold over and again on Etsy and elsewhere. It's a black onyx faceted ring nested in gold wire. The other one is a fairly new design I just made in the past 2 months. 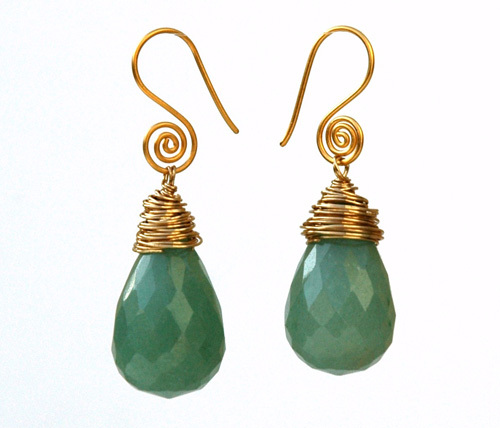 It's a pair of earrings made with a bright green colored faceted jade drop that is wire wrapped and has a swirl type earring hook. Modern style jewelry with a funky, earthy, edge. Yes, it's full time, but I'm not as busy as I would like to be. When I lived in the USA (Los Angeles, CA), I was selling wholesale, retail, artisan markets and custom designs for private clients. I'm just discovering more places to present and sell my work here in Germany and all over Europe. I still sell most of my pieces to USA customers. I work from home in our little artist loft. In an area of Cologne, Germany called Ehrenfeld. 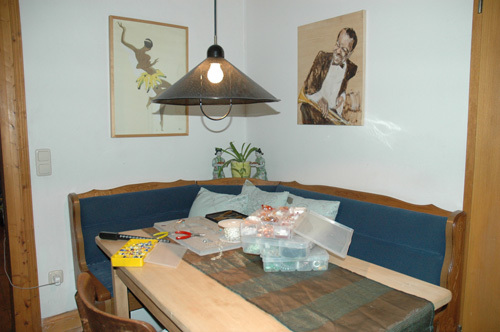 It's small, so my work space has a double purpose, my design space and the dinner table. I hope it becomes as big as it is in New York and the rest of the States. Europe has so much creative talent. It just needs a venue like Etsy to get the word out. I think the benefits are that all of us are able to support each other, make friends and provide knowledge for all things Etsy and the creative world. Nice to meet you April! That earring is just so beautiful and elegant! I love your workspace and the beautiful things that come out of it. I Love the quality and durability along with the beauty of your pieces! Thanks so much for all of your support!!!! oh cool! Thank you for introducing us to another team member. Love the glimpses into this awesmome shop and workspace!